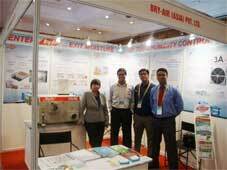 Bry-Air participated in the ICE-Global Cold Chain Expo held at Ashoka Hotel (New Delhi) between 11-13 November 2010. Bry-Air got a warm response from the cold storage industry, where the challenges of cold chain development were discussed collaboratively on the common platform. Problems related to cold storage like frequent shutdowns, wet floors, defrosting, mold and mildew growth were discussed in detail by the Bry-Air team. Bry-Air displayed it’s most simple,economic and compact solution for moisture and humidity problems, FFB-300 at ICE-Global Cold Chain Expo. 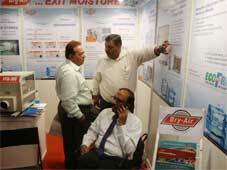 Compact dehumidifier’s can easily be mounted on floor, wall and ceiling as per the need. Here are some of the moments from the show.